Flask-REST-JSONAPI is an extension for Flask that adds support for quickly building REST APIs with huge flexibility around the JSONAPI 1.0 specification. 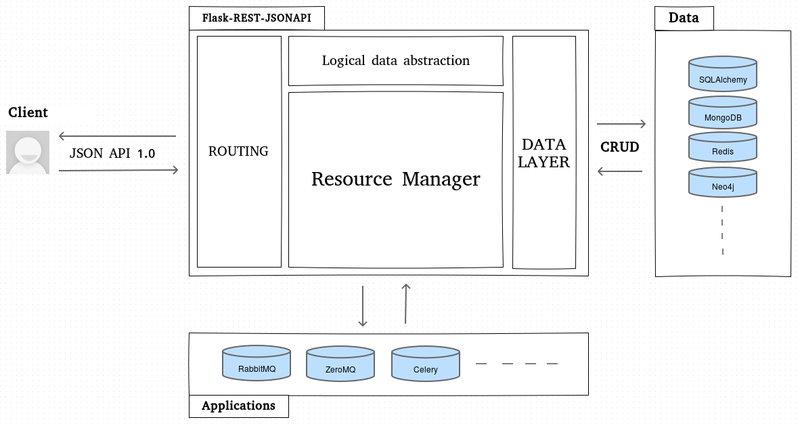 It is designed to fit the complexity of real life environments so Flask-REST-JSONAPI helps you to create a logical abstraction of your data called “resource” and can interface any kind of ORMs or data storage through data layer concept. * JSON API 1.0 specification: it is a very popular specification about client server interactions for REST JSON API. It helps you work in a team because it is very precise and sharable. Thanks to this specification your API offers lots of features like a strong structure of request and response, filtering, pagination, sparse fieldsets, including related objects, great error formatting etc. * Logical data abstraction: you usually need to expose resources to clients that don’t fit your data table architecture. For example sometimes you don’t want to expose all attributes of a table, compute additional attributes or create a resource that uses data from multiple data storages. Flask-REST-JSONAPI helps you create a logical abstraction of your data with Marshmallow / marshmallow-jsonapi so you can expose your data through a very flexible way. * Data layer: the data layer is a CRUD interface between your resource manager and your data. Thanks to it you can use any data storage or ORMs. There is an already full featured data layer that uses the SQLAlchemy ORM but you can create and use your own custom data layer to use data from your data storage(s). You can even create a data layer that uses multiple data storages and ORMs, send notifications or make any custom work during CRUD operations. This part of the documentation will show you how to get started in using Flask-REST-JSONAPI with Flask.